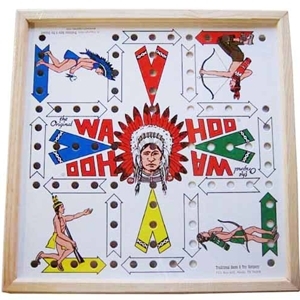 This is the original Wahoo board with images of Native Americans on it. For 2 to 4 players, ages 5 and up. Comes with marbles, 1 die, and a leather pouch. Warning! : Choking Hazard. This toy contains marbles. Not for children under 5 years.